There are three great things you can do with your family: have an adventure, experience new cultures, and make memories. One of the best ways you can do this is by traveling. Getting out of your usual environment awakens curiosity in you, your spouse, and your children. Being in a new place helps you open up to new experiences that you would not otherwise consider. What are some places you can visit that would allow you to experience a new culture and make lasting memories with your loved ones? Visiting a wildlife reserve as part of a trip to Africa is an excellent way to experience a culture that is not your own. Not only are you getting out of your comfort zone, but you are getting out of the comfort zone of most people – and hanging with an entirely different life form. Taking some time to explore Kruger Park in South Africa or the reserves of KwaZulu-Natal province can provide great, memory-building experiences for an animal-loving family. Take an entire week to hike the nearly 400-mile long Viking Trail in Newfoundland. Starting in Deer Lake and ending at St. Anthony’s near the tip of the Great Northern Peninsula, you'll march along rocky coastline through many picturesque, but sparsely-populated fishing villages. If you have the time, a side trip to the UNESCO site at L’Anse aux Meadows or Labrador would be a great addition to the trip. Staying at the Courtyard by Marriott in St. John's is also a great choice for a base camp. The southwestern United States is full of beautiful sand-and-stone vistas perfect for family camping and hiking trips. Some of the places you can visit together are Monument Valley, Yellowstone National Park, Bryce Canyon, the Grand Canyon, and the Valley of Fire. While most opportunities involve lots of hiking, water sports, horseback riding, and Native American attractions also abound. On top of that, if you want to take a break from the mountains and deserts, there's always Las Vegas with every conceivable entertainment choice available. You'll have to spend more than a few days in Argentina to get a full taste of what the South American country has to offer – starting with the vibrant and cosmopolitan Buenos Aires, where, according to Mike Unwin, “you can stroll the historic Plaza Mayo, tour Bombanero Stadium or saddle up on an out-of-town estancia for a polo lesson in the noble sport of polo.” If you prefer nature to a metropolis, you can take a hike down a jungle trail, go kayaking around the shoreline of Patagonia, take in the ice panorama of Los Glaciares National Park, or sail through the Iberian wetlands, home to caiman and capybara. 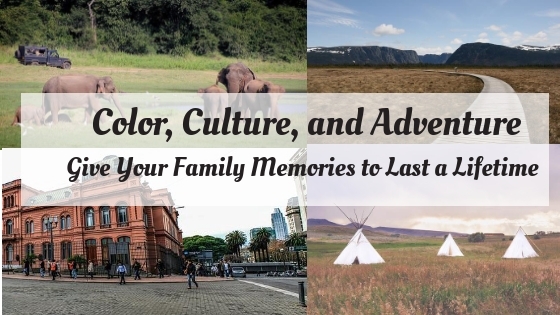 There no end of things to do, places to go, or sights to see in Argentina, and you are guaranteed to make some great memories with your family. Regardless of the trip you and your family take, the most important thing to remember is that you stick together, have fun together, and help each other enjoy our adventure. Because, in the end, it's not the place you go, but the people you go with that makes it worthwhile.